The HTC All New One (2014), codenamed M8, is getting to be the worst kept secret in recent times. 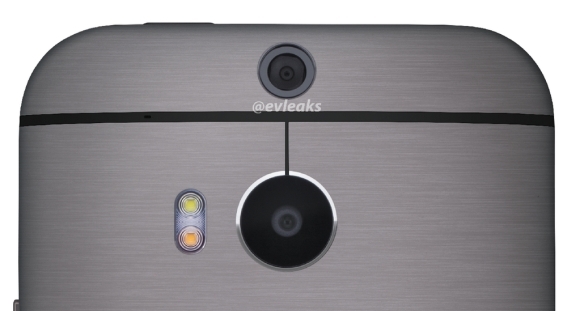 It's been leak after leak, the last one describing why there are two cameras on the back. There was also a lengthy video of it. Now we've got our hands on the complete and detailed specs of the smartphone. We also acquired what appears to be a sales guide depicting the key features of the HTC One (2014) and how the company's representative plan on marketing them. The screen will indeed be a 5" 1080p unit. The processor is quoted to be a quad-core 2.3 GHz Snapdragon 801, while the battery capacity will be 2,600 mAh. The SIM is said to be of the nano variety (like on the iPhone 5, 5c and 5s, Moto X, etc.) and there will be a microSD card slot to compliment the preloaded 16 GB of storage (10GB of which will b e user available). There's no word on the camera resolution yet but the rest of the specs appear the same as last year's model - 1/3.0" size, f/2.0 aperture, 2µm pixel size, etc. suggesting the resolution could again be 4 MP. According to the guide the video capture is still 1080p and not 4K. There will also be a rapid improvement in the front-facing camera which will now pack 5MP sensor. A Barometer is also said to be on board, but FM Radio is a no-go. You can check out the HTC One 2014 specs page, where we've added all the new info we learned. And here's the full sales guide we mentioned earlier. We've also got hold of the key apps that sales representatives would pitch to clients in the markets where those are available. The S5 is better spec but I'll still be getting the M8. For the feel of the build quality, the sound and HTC Sense. same here. I will wait for the mini version.